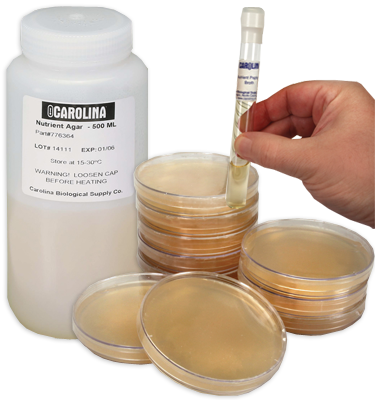 Black Agar Plates, for Small Seed, Pack of 10 is rated 5.0 out of 5 by 1. To observe germination with small seeds, these plates are non-nutritive and should not be used with bacteria. It is recommended that prepared media plates be ordered no more than 1 to 2 weeks before use, as media plates are highly perishable. Use them within 1 month of receipt for best results. Rated 5 out of 5 by LenB from Exactly What I Needed I wanted to photograph some tight closeup macro shots of tiny seeds sprouting and this worked incredibly well. It provided the moisture needed to sprout the seeds and unlike "typical" agar, I was able to repeatedly remove the lid to take photos and no mold or other contaminant grew on the agar - just the seeds. Plus the solid black background was a perfect backdrop to help focus on and show off the germinating seeds very well.